Susan Rice's Decision May Spur Political Musical Chairs In Senate : It's All Politics With U.N. Ambassador Susan Rice withdrawing her name from secretary of state consideration Thursday, attention turned to Sen. John Kerry, D-Mass., as a possible successor to Hillary Clinton. And that would have repercussions on Capitol Hill and in Massachusetts. Sen. John Kerry, D-Mass., U.N. 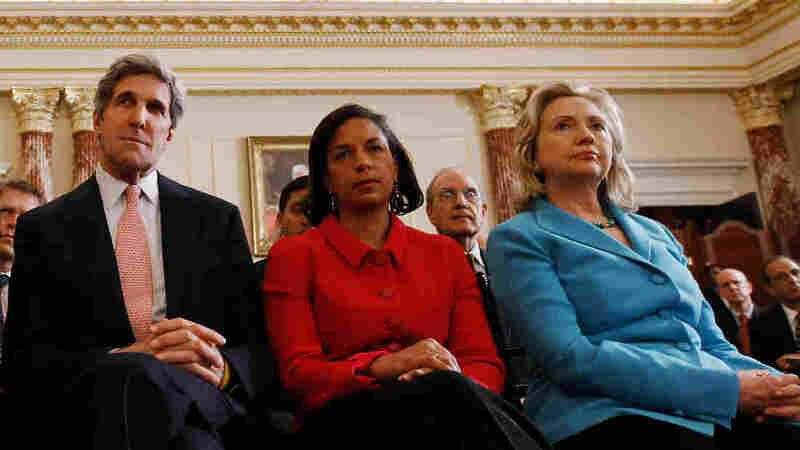 Ambassador Susan Rice, and Secretary of State Hillary Clinton listen to President Obama speak at the State Department in May 2011. With Rice withdrawing her name from consideration to succeed Clinton, speculation has turned to Kerry. Now that U.N. Ambassador Susan Rice has withdrawn her name from secretary of state consideration, the conspiracy theory that Republicans targeted her to force President Obama to name Sen. John Kerry instead, to open up a Massachusetts U.S. Senate seat for the recently defeated Sen. Scott Brown, is alive and well and ricocheting across the Internet. That doesn't mean it's true. But what is true is that Rice is out of the picture and Kerry is now a leading candidate. Kerry would seem to have much to commend him from the president's perspective. It was Kerry who, as the Democratic Party's 2004 presidential nominee, helped make Obama a national name by having him deliver the keynote speech at the quadrennial convention. Kerry was also one of Obama's earlier big endorsements in 2008, when Hillary Clinton and then-Sen. Obama were locked in a fierce battle for their party's presidential nomination. If that's not enough, Kerry is chairman of the Senate Foreign Relations Committee. And as a longtime member of the Senate club, all indications are that his confirmation would be a layup. "Even if we don't agree with Sen. Kerry on some of the domestic issues, we think that he has handled foreign relations as chairman pretty good, and so I think he'd have an easy confirmation," Grassley said Thursday. All that said, it's still possible the president could throw a curveball and nominate someone not named Kerry when Clinton steps down, which could come early in 2013. But unless it's another Senate veteran, the president could be inviting more trouble. So, assuming it's Kerry, that would mean that a Senate seat from Massachusetts would be up for grabs in a special election, likely sometime next year, depending on the timing of Clinton's exit. Brown has signaled that he doesn't necessarily see his November defeat at the hands of Sen.-elect Elizabeth Warren, a Democrat, as the end of the political road for him. "All of us, obviously, may meet again," he told his Senate colleagues in his farewell speech Wednesday from the floor of the chamber, which seemed like a pretty big hint to some. If Kerry becomes Obama's choice to head the State Department, Massachusetts law allows Gov. Deval Patrick — a Democrat — to name a replacement for the state's senior senator. The replacement would serve until the special election, within 160 days of the Senate seat's being vacated. While there's been plenty of speculation about who might replace Kerry, little of it apparently centered on Patrick. A former corporate lawyer among other things, Patrick has said he plans to re-enter the private sector on leaving the governorship. If there has been any speculation about him going to Washington, it's been as a possible successor to Attorney General Eric Holder. Speculation about which Democrats might succeed Kerry in the Senate has revolved around members of Massachusetts' congressional delegation. An Associated Press story from just after the general election reported that the list of possible Democratic candidates could include Rep.Michael Capuano. "And even though he was just elected to his first term in the state's 4th Congressional District, Joseph Kennedy III can't be dismissed as a possible Senate hopeful given how much weight the Kennedy name still holds in Massachusetts," the AP said. While the Rice saga has meaning for Massachusetts, it has obvious meaning for Obama, too. As he prepares to start his second term after handily winning re-election, Senate Republicans have sent him a reminder, in case he needed one, that there are limits to his political capital and that he might want to use what he has left wisely. A re-elected president has only so much power remaining before true lame duckness sets in. And with the president in the middle of negotiations to avoid the "fiscal cliff" — and with his need to get Congress to sign off on another debt-ceiling increase by early next year — a fight over Rice would have been just too costly to wage, and perhaps unwinnable. So Rice was sacrificed for the greater good of the president's agenda. And not just that. It's hard to have as the nation's chief diplomat someone who, for whatever reason, inspires such animosity from so many senators. "One thing that's rather distinctive here is that the secretary of state is usually above partisan politics in the sense that he or she represents the country as a whole. And I can't think of any secretary of state that met significant partisan opposition in the past. ... It would have been breaking with precedent had the president gone ahead and nominated Ambassador Rice once it was clear that there was substantial opposition. "It is a little bit unusual as well because the president won the election, and there's generally a disposition to give the president the Cabinet officers he wants in the wake of an election that he has won," said Mandelbaum.